Cameron had a great July 4th show. 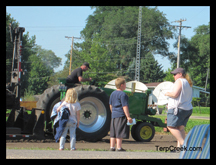 Maple City Antique Tractor Club had a tractor display and tractor games. There was a display or antique engines, homemade ice cream, great food at the fire station, pie and ice cream at the church, band, fireworks and lots more. 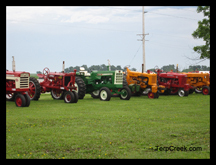 I had a barn quilt display and mailboxes with hand painted tractors on them. The weather was great! 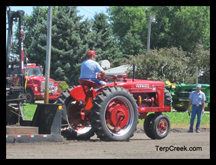 The Bald Bluff Antique Tractor Pulling Assoc. 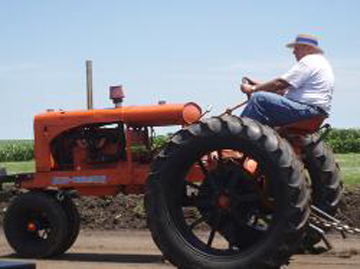 started the tractor pull with bottom classes for the plow boys and then went to the regular Bald Bluff classes. 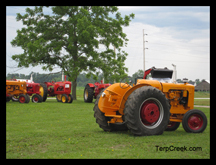 Here are a few pictures but more can be seen at http://www.terpcreek.com/Maple-City-Tractor.html. Labels: Bald Bluff Antique Tractor Assoc. We have been very busy building wooden barn quilt blocks. Dennis builds them out of 1/2 inch exterior plywood that is sanded smooth. He has built a frame around the back for hanging and strength. The blocks are primed and painted front and back. I free hand the design on the front. It is also coated to resist UV rays. You will be able to enjoy the quilt blocks for many years. The one in the picture is a 4 foot square and is on a clients backyard shed. Larger ones are also available. The 2 foot blocks are the perfect size for porches, garages, houses, cabins, privacy fences, or tool sheds. 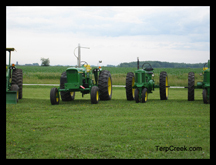 The 4 foot size are a good size for stores, garden sheds, shops, tractor sheds, cattle sheds, or hanging low on a barn. If you want a barn quilt up high on the barn an 8 foot square would be the best size. I will have sample blocks on my website soon. Custom orders are also welcomed. I will have 8 of the 2 foot square blocks done by July 4. 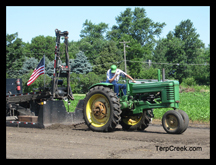 Bald Bluff Antique Tractor Pulling Assoc. 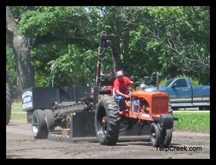 The new 2011 Bald Bluff Antique Tractor pulling schedule and rules are on www.TerpCreek.com Read them online or print them out by downloading the PDF file. 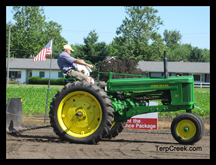 Have fun at the tractor pulls this summer! I found a great idea on the web. This link will tell you how to put gifts into balloons. 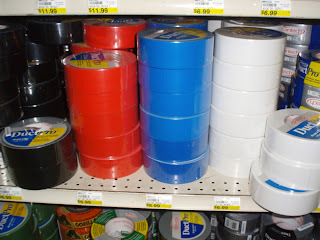 Just think how great this would look for a wedding gift with lots of ribbons tied to the top or a kid’s birthday gift with confetti in with the gift. I will have to try this great idea. I should have found this earlier because today is our anniversary. I could have put Dennis' gift in a balloon with lots of confetti. That would have been funny! I had to stop drawing barns for a while to finish one of the buildings on the Detroit showcase. The client was coming to Illinois and I wanted it finished so he could pick out the next building for the backdrop. The finished piece will measure 16 inches by 15 feet. Each building will be on a separate mount board so the client can arrange and/or rearrange the finished backdrop. This will be a backdrop for a precision car showcase. 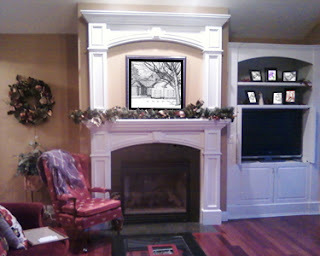 The client has picked out several vintage buildings from photos I took. 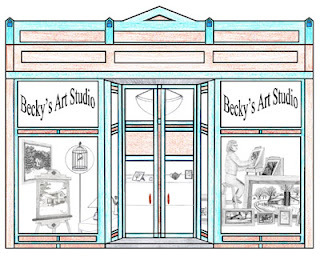 The first one they wanted done was "Becky's Art Studio". I was so happy with that choice. I will be back drawing "100 barns" next week. I have delivered new art to Bishop Hill Gallery. If you find yourself in Bishop Hill, Illinois be sure to stop by the Bishop Hill Gallery and look at all the new art they have on display. 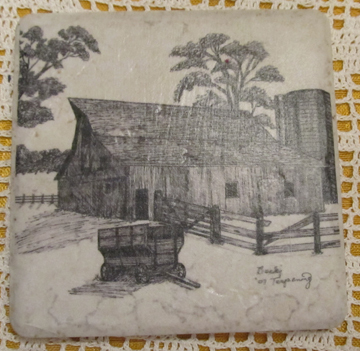 I have wall art, desk art and coasters for sale at Bishop Hill Gallery. 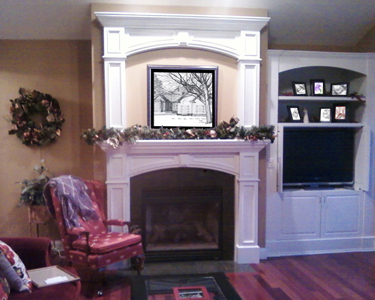 I am currently drawing some of Bishop Hill historical buildings and they should be done and at the gallery by May 13. 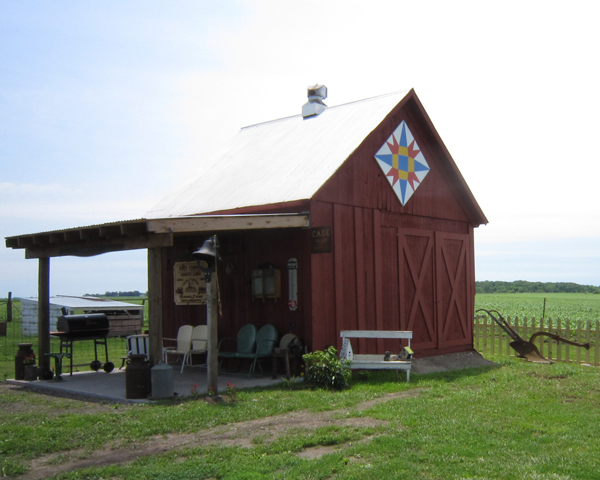 Bishop Hill, IL has lots of special events and really interesting historical buildings. It is really worth the time to take a weekend trip to Bishop Hill. If you are going to be there overnight I highly recommend the Bishop Hill Gallery Inn. I just love barns! I have drawn a lot of barns over the years but I never get tried of seeing or drawing old barns. It seems like they are fast disappearing from the family farm. 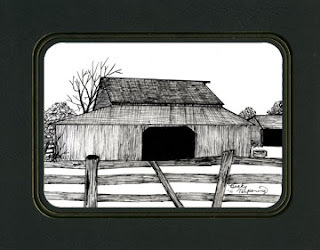 A pen and ink drawing will lock our favorite barn forever in our memory. It is really great how God uses our talents to bring great joy to others. Every drawing that I do this year will have a fish symbol hidden in it. 2010 drawings also had a hidden fish symbol. I have a lot of great childhood barn memories. It was always fun hunting eggs or finding new kittens hiding in the hay. My brother and I would spend hours in our barn swing on the hay rope, build secret rooms and making hay forts. After a brainstorming session it was decided that, since I am always up for a challenge, the newest and hardest self-imposed challenge yet would starting March 1, 2011. 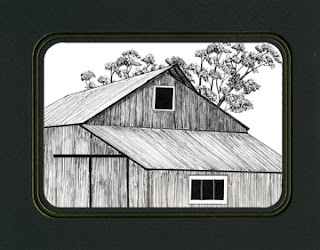 I will draw 100 barns in 100 days! That is the easy part. The hard part is the drawings will be 5"x7". As most of you know I never draw buildings smaller than 8"x10" and usually must custom drawings are at least 16"x20" and often 20"x24". The reason for the smaller drawings is to make them more affordable so anyone who has been wanting a TerpCreek original drawing could afford one. 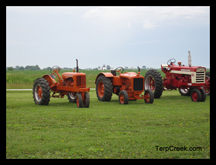 Most original TerpCreek Art is owned by high income collectors, CEOs and business owners. I am really excited about starting this project and people are starting to send me barn photos just incase I run short of ideas. 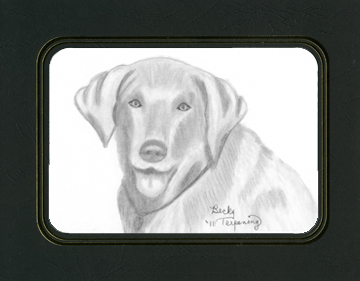 I will have to schedule my drawing time very well as I will be doing a Pet Portrait Promotion and custom artwork at the same time. 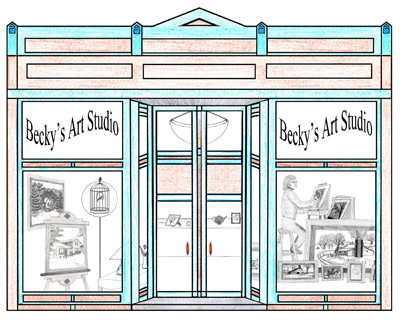 I have also promised to deliver two original drawing to the Freeport Museum in April for their Masterpiece Art Show which is in May. 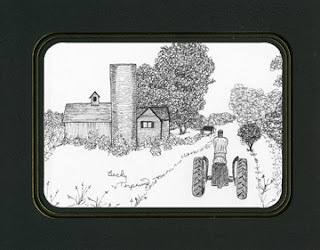 The barn drawings will be for sale on eBay (type TerpCreek in the search box to find the drawings). This will be a great way to get an original TerpCreek drawing at a bargain price. All drawings will come in a black mat with gold trim, signed, dated and with a Certificate of Authenticity. 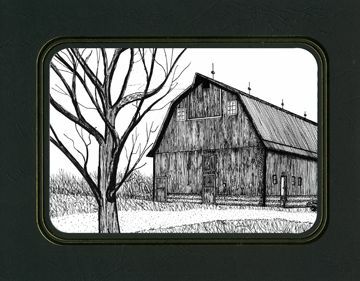 Join the "Barn Lover" group and get a chance once a week to buy one of these original barn drawings without having to bid on it. Once a week I will email you a picture of the barn that is available for purchase to those in the Barn Lover's group. The first person to email me that they want to buy it will get it. 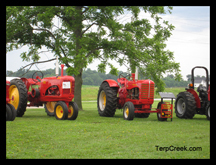 It is free to become a "Barn Lover" just email me at Becky@TerpCreek.com put barn lover in the subject line. That is all there is to become a "Barn Lover. In the future there will be barn items that only Barn Lovers can buy. Barn Lovers will also get specials offers. I will not sell or share your email address with others. So get excited and join the Barn Lovers!